While we're talking, envious time is fleeing, pluck the day, and put no trust in the future. The future is unforeseen and that one should not leave to chance future happenings, but rather one should do all one can today to make one's future better. We should not neglect the future. You shouldn't believe that everything is going to fall into place for you automatically, but you should take action for the future today. Tomorrow is promised to no one! But most of the time, we proceed as if we are going to live forever and never think about it. Put off until tomorrow only what you want to leave unfinished if you die tonight. We are mortal beings and we can go at any time. Be present now. Be in the moment, only in this moment and your world will expand exponentially. Most of us find it difficult to be in the moment, we are either thinking about what has already happened or thinking about what's to come more which we can only prepare for. When you are in the moment, you are truly living. 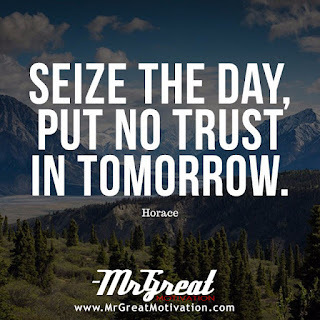 Put no trust in the tomorrow. Stop putting off the important things in life and get doing them! 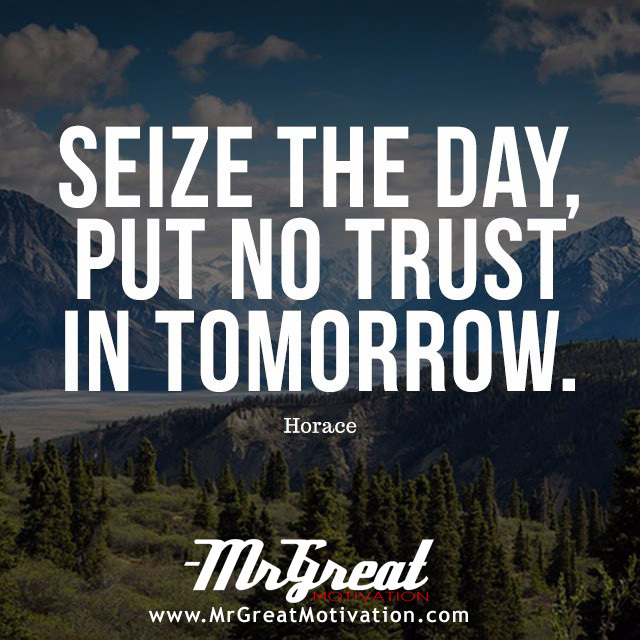 Seize the day. Stay Motivated. Make a difference!